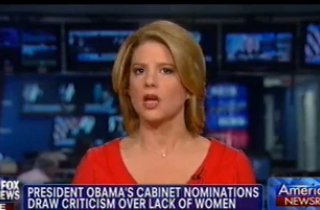 During a Fox News panel discussion this morning, both Democratic contributor Kirsten Powers and Republican strategist Dee Dee Benkie slammed President Obama for his “boys’ club” of a cabinet, contrasting the president’s lack of female cohorts with the 2012 campaign rhetoric largely centered around appealing to women voters. Host Martha MacCallum displayed the New York Times photograph of the president and ten male advisers in the Oval Office, with Valerie Jarrett blocked out. Co-panelist Benkie chimed in that after the Obama campaign spent months talking about “how he was going to be better for women and how there was the war on women, and it was all about women,” the president now “owes women” and yet can’t find “capable women” to fill his empty cabinet spots.